When I see or purchase an imported product, I can't help but think about the country of origin and its people. Are its people better off? Are their lives being improved? But we know it is not always for the better. Natural resources and minerals from Congo (Democratic Republic of the Congo) are examples of mixed results. As an avid coffee and tea drinker, I always wanted to see Congolese coffee and tea in the marketplace. Reaching the marketplace, both internal and external, is a key to breaking the cycle of poverty in a country like the Congo. BUKAVU, Democratic Republic of the Congo—Jeannine Balagizi is the mother of seven children, about average for a woman in South Kivu province in the Democratic Republic of the Congo (DRC). She is also a passionate grower of high-quality Arabica coffee, less common in an area better known in recent decades for its armed conflict than its coffee fields. Coffee, however, is gaining ground. On March 22, the American giant Starbucks (link is external) launched its first single-origin specialty coffee from South Kivu in 1,500 stores across North America and online. This coffee was grown and processed by Balagizi and 4,500 other small-scale farmers whose cooperatives are breathing new life into the DRC’s coffee sector with the help of a four-year project funded by USAID and the Howard G. Buffett Foundation (link is external). Ending extreme poverty requires tackling the global water and sanitation crisis, a valuable investment in public health that will help protect people from diseases such as Ebola and cholera. Doctors Without Borders explains that disease outbreaks are more likely to occur in areas where hospitals have poor infection control and limited access to running water. In West Africa, for example, this lack of access to water and basic sanitation has made responding to Ebola slower and riskier for everyone involved. Lack of access to water and basic sanitation threats the education of millions of girls. Education helps break the poverty cycle. Rising inequality translates to rising extreme poverty. The numbers and percent of population living in extreme poverty is going up. 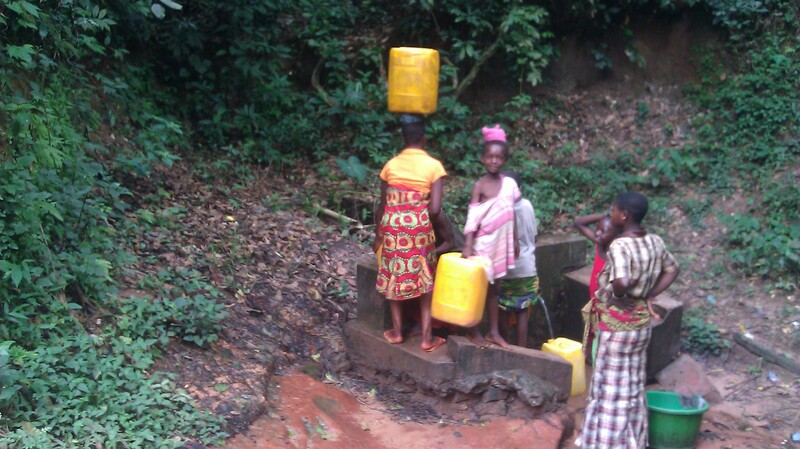 Achieving the Millennium Development Goal (MDG) for water is within reach even for rural Congo. It will not be done by 2015 but at some point in the not too distance future. However, sanitation is problem globally. I see the sanitation problem and related issues every where. It's a stinking, dirty mess! Fifty years ago, I hated going into outhouses in the rural South (US). Today, I hate going into pit latrines in urban Congo. When is it going to end? Over 2.5 billion people currently lack access to improved sanitation - including one billion people practicing open defecation. Addressing the ‘unfinished business’ of the MDGs is a high priority in the post-2015 sustainable development framework. There is growing country based and global stakeholder consensus that post-2015 sanitation related goals and targets should aim for the global elimination of open defecation by 2025 and the universal access to sanitation by 2030. In April 2013 the World Bank Development Committee endorsed the following goals: End extreme poverty and; promote shared prosperity and foster income growth of the bottom 40% of the population in every country. Eliminating open defecation globally and achieving universal access to sanitation is key to achieving both of these goals. Malaria is preventable and curable. But the poor don't have the resources. Thousands of children under five years old die each year. Insecticide treated nets (ITN) are not available in some areas. And when they are available, their costs may put them out of reach of the poor. Finally, the availability and cost of treatment repeats the same story. KAMPALA, 20 May 2013 (IRIN) - Gaps in the healthcare system in the Democratic Republic of Congo (DRC) are hampering the fight against malaria, a leading killer of children, say experts. Too many babies in Congo don't survive their first day of life. More than one million babies a year die the day they are born, and the 14 countries with the highest rates of first-day deaths are all in Africa, according to a report released on Tuesday. The five countries with the highest rates of such deaths are Somalia, the Democratic Republic of Congo, Mali, Sierra Leone and the Central African Republic, according to the report, “Surviving the First Day,” from the aid group Save the Children. Holy Mental Deficits! Wow! Cassava could be mentally retarding babies and children. Congolese babies are weaned on cassava. It's their first food. And they grow up eating it at least once a day or more. More tests should be done. Since it acts like lead paint toxic, then what do you do for the hundreds of millions of babies and children who eat it every day? Konzo, a disease that comes from eating bitter cassava that has not been prepared properly - that is, soaked for days to break down its natural cyanide - has long been known to cripple children. The name, from the Yaka language of Central Africa, means "tied legs," and victims stumble as if their knees were bound together. Now researchers have found that children who live where konzo is common but have no obvious physical symptoms may still have mental deficits from the illness. Cassava, also called manioc or tapioca, is eaten by 800 million people around the world and is a staple in Africa, where bitter varieties grow well even in arid regions. When properly soaked and dried, and especially when people have protein in their diet, bitter cassava is "pretty safe," said Michael J. Boivin, a Michigan State psychiatry professor and lead author of a study published online by Pediatrics. "But in times of war, famine, displacement and hardship, people take shortcuts." In the Democratic Republic of Congo, Dr. Boivin and colleagues gave tests of mental acuity and dexterity to three groups of children. Two groups were from a village near the Angolan border with regular konzo outbreaks: Half had leg problems; half did not but had cyanide in their urine. The third was from a village 125 miles away with a similar diet but little konzo because residents routinely detoxified cassava before cooking it. The children from the latter village did "significantly better" on tests of remembering numbers, identifying objects, following mazes and fitting blocks together, while healthy-looking children from the first village did almost as badly as children with obvious konzo. The mental damage was like that done by lead exposure but more subtle, Dr. Boivin said.